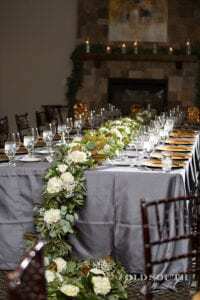 Head Table, Kings Table, and Sweetheart Table – What You Need to Know! Deciding how you and your bridal party will enjoy the reception is an important task that can often feel overwhelming. 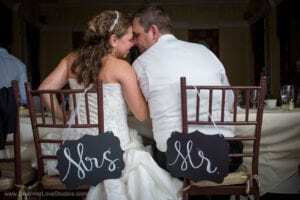 I am sure you have heard the terms Head Table, Kings Table, and Sweetheart Table, but you may not know what they mean or how they look. 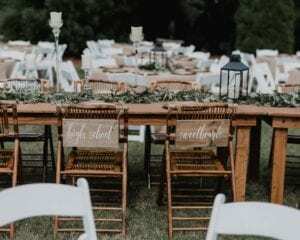 Today we will take the guesswork out of these options and take a look at their different setups so you can decide the fit that works best for you and your guests on your big day! This is probably the most familiar to us. 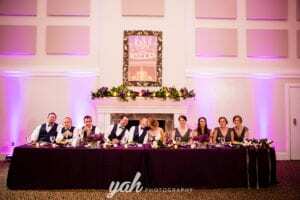 A head table is a long table that houses the entire bridal party the bride and groom sit toward the middle, with the bridesmaids lined up next to the bride and the groomsmen lined up next to the groom. This option is great for your photography, everyone important is lined up in one place. Plus they can get some awesome shots of you and your groom as the important people of your life give toasts. However, conversation is difficult in this setup, since you are all facing one direction your can only really talk to the people sitting next to you. Additionally plus ones of your bridal party will have to sit at separate tables. This option resembles a head table but is bigger and better. A King Table is a large rectangular table that often sits in the middle of the room. Guests are seated around all sides with the bride and groom next to each other in the middle. This option allows bridal party, their plus ones, and even family of the bride and groom to sit together. Since guests seated here are facing each other they can have open conversations and you can be more engaged with the people who mean the most to you. With all good things there are drawbacks though, it may be harder for your photographer to get good shots of just the two of you, since others may be blocking their path. And since the table is so large it might not be a good fit if your venue is short on space. Usually set in a prominent location in the room, a sweetheart table is a small intimate two top. And let’s face it after a hectic morning of hair and makeup and a barrage of pictures it would be nice for you and your new husband to enjoy your first meal together! Your photographer is sure to get some great pictures of the two of you enjoying your night together. 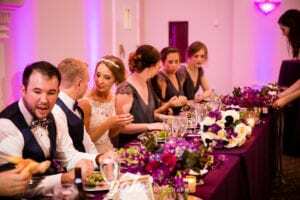 However, your bridal party and family would be placed at separate tables around the room making it harder to spend time with them. As you can see each one of these options has its advantages and its drawbacks. When thinking about how you and your groom will enjoy your reception, discuss your options and find out what works best for you and your venue space. Want more pro tips on how to plan your wedding? Contact Magnificent Moments Weddings today we can help with this decision and just about any other.